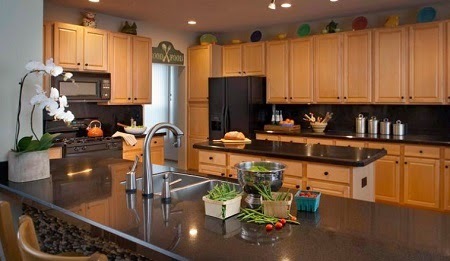 With new materials being developed all the time, there are numerous factors to consider in picking a counter top but one simple way to begin is to think Rock, Paper or Steel. Here are some pros and cons. Pros: More durable than marble, won't scratch, resistant to stains, heat and water if sealed, low-maintenance, high resale value, lots of color options. Cons: Expensive, requires resealing about once a year. Pros: Nonporous, resists scratches and stains, easy to maintain, no sealant required. Looks like natural stone (it's at least 90% quartz) but can be mixed with pigments for custom color. Paper countertops? You read it right. Created from paper fibers mixed with resin. Pros: Paper composite evokes the look of solid surfacing or laminate but with a warmer sensibility. It's surprisingly hardy and can withstand heat and water admirably. It's also a great deal lighter than natural stone or concrete. Cons: The material isn't scratchproof and is susceptible to chemical damage. It needs an occasional rubdown with mineral oil, and even sanding, to refresh it. Although it sounds as though it would be a lower-budget option, it isn't. Cons: Fingerprints show and must be wiped off frequently, and stainless steel can also dent. It can be loud as pots, pans and dishware clang against the surface. Chemicals can affect its color and cause unwanted etching.